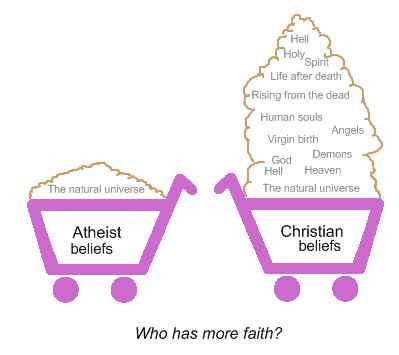 It is often said that atheists have the same amount of faith as Christians. This is a common argument, and my response to this claim is the following question: which of the two belief systems has the most amount of assumptions? I think that both the Christian and atheist assume (probably by faith) that there is an objective reality outside of ourselves, and that there is some sort of natural order that we all experience. But the Christian is generally the one who believes in incredible events that defy the natural order, such as virgin births, people rising from the dead and parting seas. These events are incredibly alien to our everyday experience and current knowledge of how the world works; they are the 'outliers', the exception-rather-than-the-rule kind of phenomena. As an atheist, I base my beliefs on the rule-rather-than-the-exception: balls thrown into the air generally fall down; people who die generally stay dead; water does not generally transform itself into wine. As an atheist, the natural order – or the natural world – is all I believe in. Christianity requires the additional element of the supernatural, which includes God, demons, angels, hell, heaven, the soul, etc, etc. It seems to have many more – and I believe, largely unsupported – beliefs.